Why do we need to worry about scaffolding safety? There are many dangers on construction sites; some are obvious - like heavy machinery, equipment, deep excavations and trenches - while others dangers to site safety are more subtle like vibrations and incremental repetitive stresses. There are also a number of site activities which fall somewhere in the middle of these two extremes. We understand the dangers of these things or activities, but often overlook them or become complacent when performing or conducting them because of how 'normal' they are. Scaffolding falls into this middle ground The dangers of scaffolding are quite obvious, including falling from heights, falling objects and scaffolding structures slipping or giving way on uneven or unsuitable ground. But the dangers of scaffolding are often ignored or overlooked because of how frequently it is used, because of how normal scaffold has become on construction sites, and because of how comfortable people feel when working on a platform which 'seems like the ground'. All of these complacencies and minor frame of mind elements can lower the level of care taken by many different site parties, which forms part of the very real danger of scaffolding. In the United States alone, around 10,000 construction workers are injured every year in scaffolding accidents, and 88 people died in a single year (2007). While some of these incidents are more avoidable than others, estimates show that around 50% of these incidents could have been prevented if the right scaffolding safety practices were maintained (and if the scaffolding safety tips were heeded). Some of these incidents occur because of negligence on the part of people working on scaffolding, while a fair share are also caused by the poor assembly of structures, the poor maintenance and inadequate inspections of scaffolding, and even . by design and manufacturing errors and flaws. Managing scaffolding safety in the right way can dramatically impact scaffolding and scaffolding work safety - which is why we have put together these scaffolding safety tips. Some of the below scaffolding safety tips are intended for large-scale construction sites, while others are more specific for small scaffolds which are erected and managed for smaller scale jobs. Whatever type of construction projects you manage, these safety tips should still be relevant and applicable for your sites and work. On too many construction sites, scaffolding is erected properly and deemed 'complete' for the remainder of the project. But like most things in the construction industry, scaffolding needs to be inspected throughout the life of the project, to ensure that it it's integrity and safety remains. Hundreds of moving pieces and people, as well as vibrations and shifts in the site environment itself can easily move or alter scaffold. 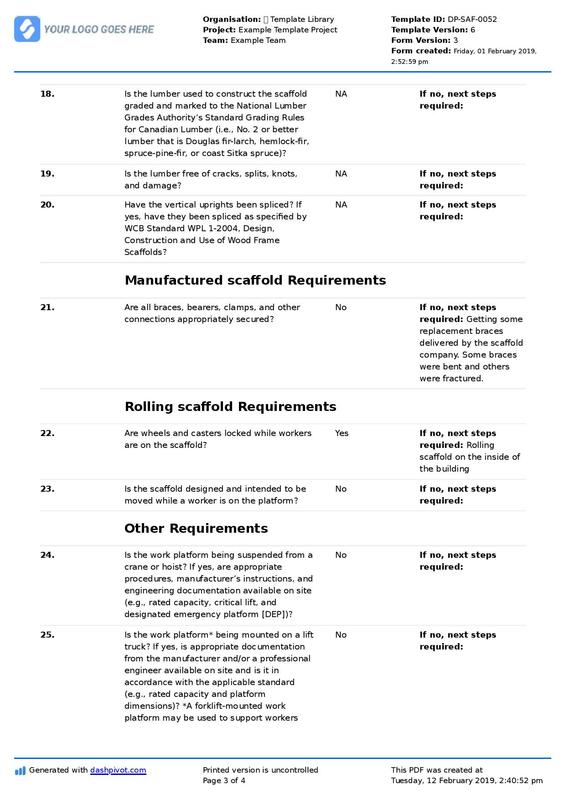 It's imperative for scaffolding safety that inspections are conducted properly (using an inspection framework like below) and that inspections continue at scheduled intervals. This is my most important scaffolding safety tip, because the impact of scaffolding collapsing or falling because it hasn't been inspected properly can be catastrophic and widespread. It's also important because it protects against many of the scaffolding safety hazards, including manufacturing and design issues as well as installation and wear-and-tear issues. 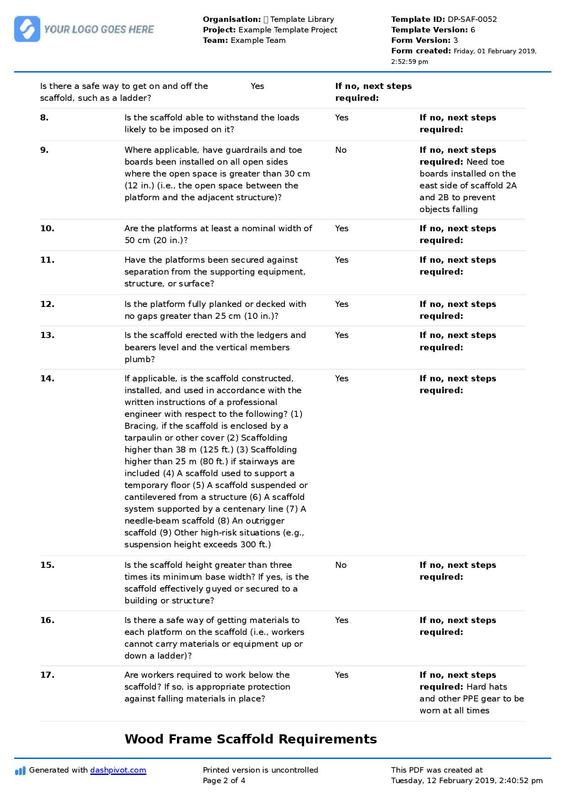 Use this scaffold safety form for free. You would think this one was a no-brainer, but companies and workers can often give the green light to scaffolding work without realising that people aren't equipped for the job. This training must be conducted by a qualified person and not be a few minute induction by someone who is currently on the scaffold. One of the inherent dangers of scaffold is that the surfaces scaffold is used on and for is often uneven and can even be soft (sand etc.). Scaffold frames are designed for use with casters or base plates, so make sure you have a stable base using these items. Small wooden base plates are great, because the slight flex in wood ensures an even distribute of weight. Even so, make sure you understand the load rating of your scaffold, because too much weight and too many workers can be dangerous for all. This scaffold safety tip is in relation to the inspection safety tip, and involves better managing all of your safety documentation. Even if you perform all of your inspections properly, you still need a reliable and secure way of knowing when the inspections were performed, the outcomes of those inspections, and when more checks need to be performed. 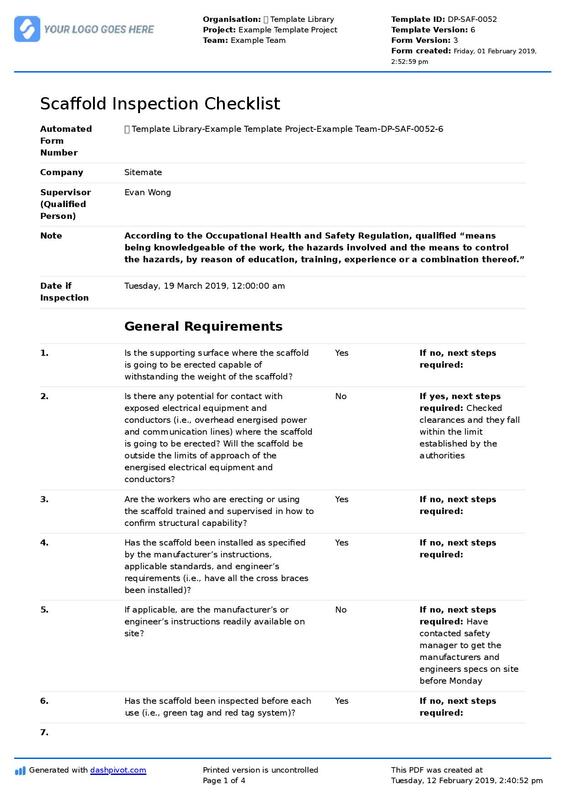 The best way to track inspection forms and important documents on construction and industrial sites is the register. Maintaining an up-to-date scaffolding inspection register is a great way to keep your company, projects and teams on top of everything scaffold related. It's even more ideal if workers can access and look at scaffold records so that they can do quick checks before jumping into work. Use this scaffold safety register for free. Many people see scaffold as infrastructure to stand on, but you can build comfortable workspaces on scaffold - by using scaffold. Many tradesmen and site workers throw scaffold up and jump on it to get the job done quickly, and end up working in an awkward scenario where they don't have a place to put their tools or supplies. This is uncomfortable, can lead to a lack of concentration, and can also result in dropping objects off the scaffold as well as slipping on objects which have been placed on the floor of the scaffold. Create a workbench by placing scaffold planks at a higher level than what you are working on so you have a nice space to put your things and a better place to work. This scaffolding safety tip is particularly useful for a single tradesman or working on a small area where you will be for a few days. Another obvious one, but one which can be easily overlooked or ignored is to not use scaffold (or anything other than a suitable ladder) to get up on the scaffold. Although scaffold does make for a fun and impressive climbing frame, climbing on the outside of a tall and potential unstable platform is not safe. Make sure workers have easy access to scaffold ladders, and that when they are working frequently in one area, that there is a ladder in close proximity to remove the temptation of using the scaffold as a monkey gym. Another one of the more common scaffolding hazards which leads to a number of avoidable injuries and issues is workers using boxes, crates and other objects to give themselves a little additional height. Standing on a plastic crate or box, on top of scaffolding is asking for trouble - so this is a must-heed safety tip for all of your sites. Encourage yourself and other workers to be mindful while working on and around scaffold at all times. Even though everyone has their PPE and hardhats on, it's important to remain vigilant of what's happening from above. It's equally important to keep track of what's happening below. Being aware of falling object hazards and where there are big groups of people or frequent walk-ways helps to mitigate the chances of falling object injuries. And looking down doesn't start at the ground. Keep a constant eye on the state of the scaffolding surface. Bricks, mud, rain and other materials can build up on the surface of scaffold, and a little slip or trip can result in a big incident. 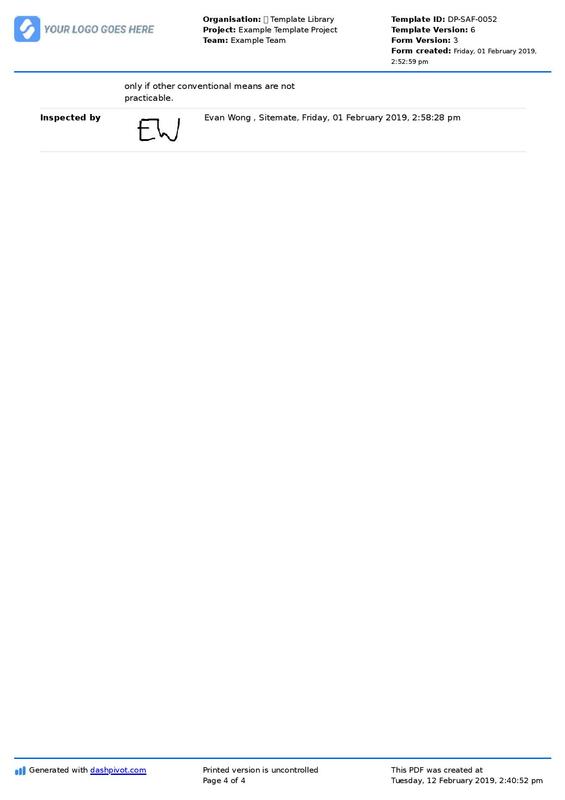 We have easy access to some of the scaffolding safety tips documents and forms below, so you can use them to improve your scaffolding inspections and records straight away. Most of the other safety tips involve safety training, being open about scaffold safety, and individuals being more cognisant of scaffold hazards and dangers. 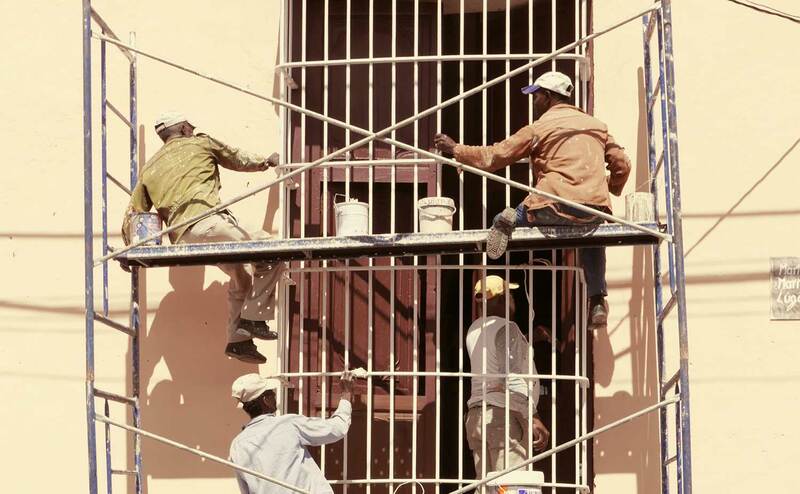 When you put some of these practices and tips into place, you will be mitigating many of the risks which result in scaffolding incidents, which means more people are going to get home safe. 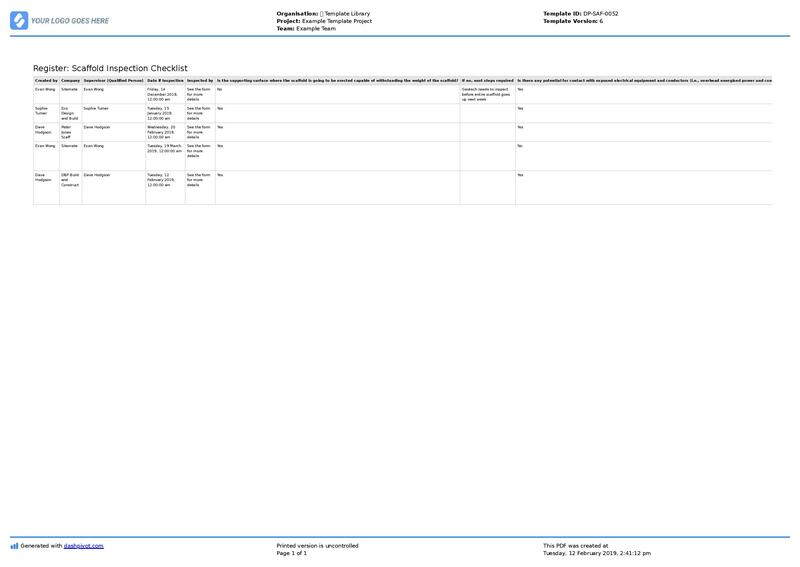 Stay on top of the frequency and outcomes of your all-important scaffold inepctions using this template.